This chapter presents evidence that snow, ice, and permafrost are changing across Canada because of increasing temperatures and changes in precipitation. 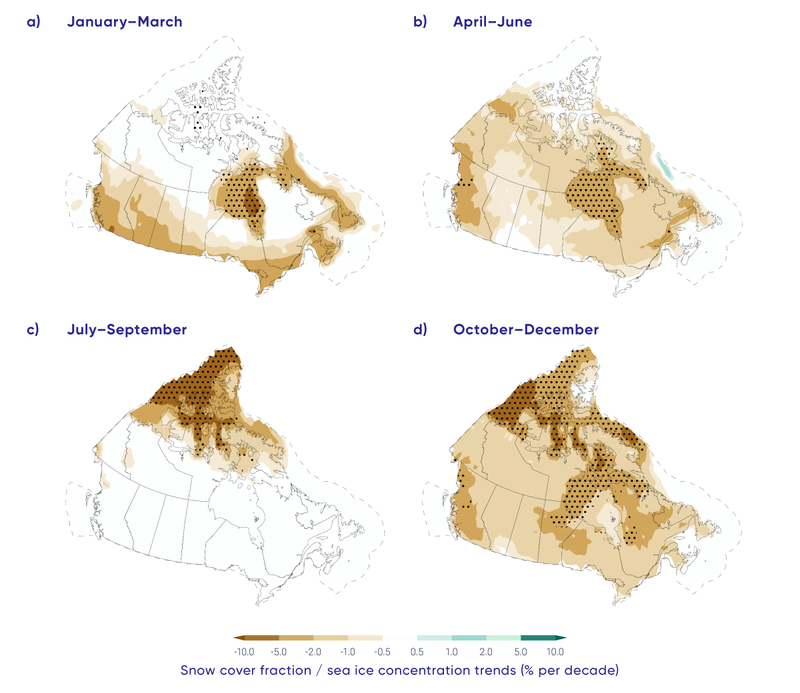 Derksen, C., Burgess, D., Duguay, C., Howell, S., Mudryk, L., Smith, S., Thackeray, C. and Kirchmeier-Young, M. (2019): Changes in snow, ice, and permafrost across Canada; Chapter 5 in Canada’s Changing Climate Report, (ed.) E. Bush and D.S. Lemmen; Government of Canada, Ottawa, Ontario, p. 194-260. The portion of the year with snow cover decreased across most of Canada (very high confidence1) as did the seasonal snow accumulation (medium confidence). Snow cover fraction decreased between 5% and 10% per decade since 1981 due to later snow onset and earlier spring melt. Seasonal snow accumulation decreased by 5% to 10% per decade since 1981 with the exception of southern Saskatchewan, and parts of Alberta and British Columbia (increases of 2% to 5% per decade). It is very likely that snow cover duration will decline to mid-century across Canada due to increases in surface air temperature under all emissions scenarios. Scenario-based differences in projected spring snow cover emerge by the end of the century, with stabilized snow loss for a medium emission scenario but continued snow loss under a high emission scenario (high confidence). A reduction of 5% to 10% per decade in seasonal snow accumulation is projected through to mid-century for much of southern Canada; only small changes in snow accumulation are projected for northern regions of Canada (medium confidence). Perennial sea ice in the Canadian Arctic is being replaced by thinner seasonal sea ice (very high confidence). Summer sea ice area (particularly multi-year ice area) declined across the Canadian Arctic at a rate of 5% per decade to 20% per decade since 1968 (depending on region); winter sea ice area decreased in eastern Canada by 8% per decade. It is very likely that increased temperatures under all emissions scenarios will result in continued reduction in sea ice area across the Canadian Arctic in summer and the east coast in winter. Most Canadian Arctic marine regions will be sea ice-free for part of the summer by 2050 (medium confidence), although the region to the north of the Canadian Arctic Archipelago and Greenland will be the last area in the Arctic with multi-year ice present during the summer (very high confidence). Multi-year ice will, therefore, still drift into the Northwest Passage (and present a navigation hazard for shipping) even when the Arctic Ocean is sea ice-free during the summer. Canada’s Arctic and alpine glaciers have thinned over the past five decades due to increasing surface temperatures; recent mass loss rates are unprecedented over several millennia (very high confidence). Mass loss from glaciers and ice caps in the Canadian Arctic represent the third largest cryosphere contributor to global sea level rise (after the Greenland and Antarctic ice sheets) (very high confidence). Under a medium emission scenario, it is projected that glaciers across the Western Cordillera will lose 74% to 96% of their volume by late century (high confidence). An associated decline in glacial meltwater supply to rivers and streams (with impacts on freshwater availability) will emerge by mid-century (medium confidence). Most small ice caps and ice shelves in the Canadian Arctic will disappear by 2100 (very high confidence). The duration of seasonal lake ice cover has declined across Canada over the past five decades due to later ice formation in fall and earlier spring breakup (high confidence). Seasonal maximum lake ice cover for the Great Lakes is highly variable since 1971 (very high confidence), with no significant trend. Spring lake ice breakup will be 10 to 25 days earlier by mid-century, and fall freeze-up 5 to 15 days later, depending on the emissions scenario and lake-specific characteristics such as depth (medium confidence). Permafrost temperature has increased over the past 3–4 decades (very high confidence). Regional observations identify warming rates of about 0.1°C per decade in the central Mackenzie Valley and 0.3°C to 0.5°C per decade in the high Arctic. Active layer thickness has increased by approximately 10% since 2000 in the Mackenzie Valley. Widespread formation of thermokarst landforms have been observed across northern Canada. Increases in mean air temperature over land underlain with permafrost are projected under all emissions scenarios, resulting in continued permafrost warming and thawing over large areas by mid-century (high confidence) with impacts on northern infrastructure and the carbon cycle. Over the past three decades, the proportion of Canadian land and marine areas covered by snow and ice have decreased, and permafrost temperatures have risen (see Figure 5.1). These changes to the Canadian cryosphere are consistent to those observed in other northern regions (Alaska, northern Europe, and Russia). SCD and SWE from a blend of five snow products; ICD from satellite passive microwave data; and SIT from the PIOMAS Arctic Sea Ice Volume Reanalysis. Ice cap volume data from David Burgess, Natural Resources Canada; ground temperature data from Sharon Smith, Natural Resources Canada; lake ice thickness data from Claude Duguay, University of Waterloo; Arctic river discharge data from Stephen Dery, University of Northern British Columbia. 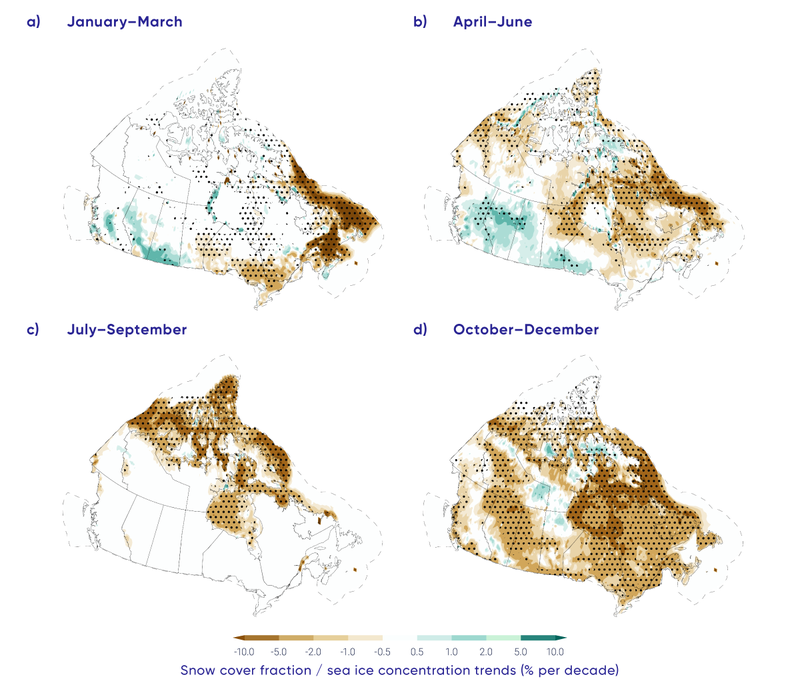 Snow cover fraction (SCF) decreased across most of Canada during the 1981–2015 period due to delayed snow cover onset in fall and earlier snow melt in spring. Regional and seasonal variability in the SCF trends reflects internal climate variability in surface temperature trends. Over the same time period, seasonal maximum snow water equivalent (SWEmax), which is indicative of seasonally accumulated snow available for spring melt, decreased across the Maritimes, southern Ontario, and nearly all of Canadian land areas north of 55° north latitude, while it increased across southern Saskatchewan and parts of Alberta and British Columbia. Significant reductions in sea ice area over the period 1968–2016 were evident in the summer and fall across the Canadian Arctic (5% to 20% per decade, depending on region), and in winter and spring in eastern Canadian waters (5% to 10% per decade). 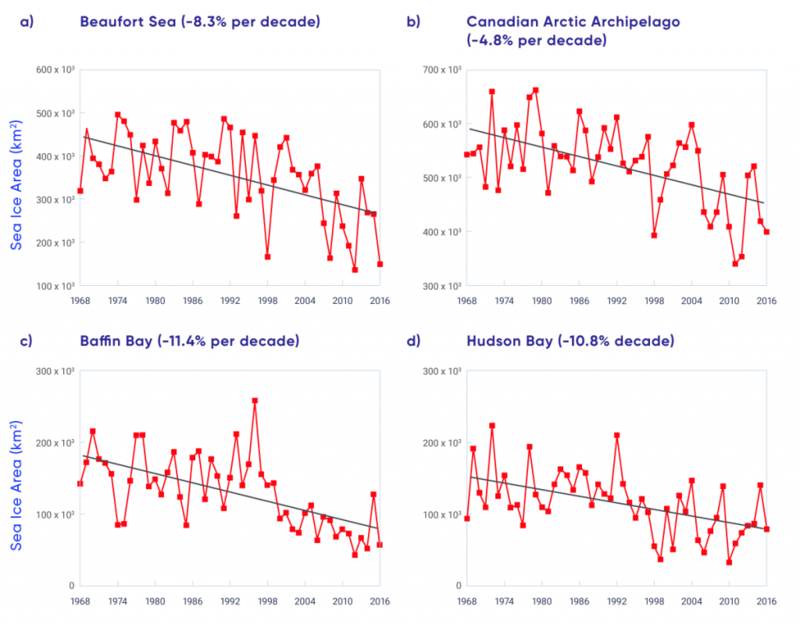 Perennial sea ice in the Canadian Arctic is being replaced by thinner seasonal sea ice: multi-year ice losses are greatest in the Beaufort Sea and the Canadian Arctic Archipelago (CAA), approaching 10% per decade. Sixty-year records of landfast sea ice thickness show evidence of thinning ice in the CAA. Glaciers in Canada have receded over the past century, with a rapid acceleration in area and mass losses over the past decade, due primarily to increasing air temperature. Recent mass loss rates are unprecedented over several millennia. Lake ice cover is changing across Canada, driven primarily by earlier spring breakup. Seasonal ice cover duration declined for approximately 80% of Arctic lakes between 2002 and 2015. Permafrost in the central and southern Mackenzie Valley has warmed at a rate of approximately 0.2°C per decade since the mid-1980s. While modest, these increases are important because permafrost temperatures in these regions are currently close to zero, so the ground is vulnerable to thawing. Permafrost temperatures in the high Arctic have increased at higher rates than in the sub-Arctic, ranging between 0.7°C and 1°C per decade. These changes to the cryosphere during recent decades are in large part a response to increasing surface temperatures. Regional and seasonal variability are due to natural climate variability in surface temperature trends, changes in the amount and the phase (rain or snow) of precipitation, and to remote influences within the global climate system (such as variations in ocean circulation and sea surface temperatures). Changes to individual components of the cryosphere are interconnected. For example, snow is an effective insulator, so changes in the timing of snow cover onset and the seasonal accumulation of snow strongly influence underlying ground temperature and the thickness of lake and sea ice. Further changes to the cryosphere over the coming decades are virtually certain, as temperatures are projected to increase under all future emission scenarios. There is robust evidence that snow cover extent and accumulation, sea ice extent and overall thickness, and the mass of land ice will continue to decrease across Canada throughout the 21st century. Most Canadian Arctic marine regions could be sea ice–free for at least one month in the summer by 2050, but sea ice will continue to be found along the northern coast of the CAA. Reductions in glacier mass in western Canada will impact the magnitude and seasonality of streamflow, affecting the availability of freshwater for human use. Warming will lead to a loss of permafrost and alteration of the landscape as thawing occurs. These changes to the cryosphere will not be spatially uniform due to regional effects of natural climate variability at decadal to multi-decadal time scales. The term “cryosphere” refers to places on the Earth where water is frozen, and includes snow, sea ice, land ice (glaciers and ice caps), freshwater ice (lake and river ice), permafrost, and seasonally frozen ground. Although the term may not be broadly familiar to Canadians, the cryosphere is a defining component of Canada’s landscape for at least part of each year, and for the entire year at higher latitudes and elevations. The cryosphere plays a key role in the climate system by influencing surface reflectivity (albedo — snow and ice are highly reflective of incoming solar energy; see Chapter 2, Box 2.3), heat transfer (snow is a highly effective insulator of the underlying soil or ice), and hydrological processes (water storage and runoff). It also has important ecosystem linkages, as many organisms have adapted to living in or on snow and ice. These range from distinctive microbial communities, to seals and polar bears, which rely on sea ice for breeding, feeding, and mobility. Ice cover influences the algae growing season, water temperature, and oxygen levels, as well as allowing wildlife to reach shorelines and cross water bodies. The state of the cryosphere also influences the Canadian economy by supplying freshwater from snow and glaciers for human use during melt periods, impacting shipping and offshore operations, facilitating northern transportation and resource extraction through ice roads, and supporting winter recreation. It also contributes to a wide range of hazards such as spring flooding, avalanches, as well as landscape instability as permafrost thaws. The cryosphere is also critically important in the traditional ways of life of many Indigenous communities, particularly in the North. As well as influencing the abundance and location of land, freshwater, and marine resources on which these communities depend, snow, ice, and permafrost also affect access to these resources. This chapter provides an assessment of observed and projected changes in the Canadian cryosphere. This updates a review conducted as part of the 2007/2008 International Polar Year (Derksen et al., 201238) and a previous overview of Canada’s changing climate (Bush et al., 201429), as well as complementing recent assessments of the global (Vaughan et al., 2013187) and Arctic (AMAP, 2017a5) cryosphere. When appropriate, the longest available datasets of continuous surface measurements from observation sites are provided (for example, glacier mass balance, permafrost temperature). Otherwise, validated datasets from remote sensing and land surface models are utilized to provide information for large areas (for example, sea ice concentration, snow cover fraction, lake ice cover). The historical periods vary between components of the cryosphere, depending on the available data, but extend from at least 1981 to present. Projected changes to the cryosphere are based on state-of-the-art climate model simulations from the fifth phase of the Coupled Model Intercomparison Project (CMIP5) (https://esgf-node.llnl.gov/projects/cmip5/) (see Chapter 3, Box 3.1). In some cases, these models simulate variables that can be directly compared with observations — for example, snow cover fraction. In other cases, analysis of model projections is more complicated, either because the models do not directly simulate the variable of interest (e.g., permafrost area needs to be inferred from soil temperature) or the spatial resolution of global models is too coarse to provide information on individual features of interest (i.e., specific lakes or glaciers) (see Chapter 3, Figure 3.2 for an explanation of models). Changes in temperature and precipitation are the primary drivers of variability and change in the cryosphere — these variables are discussed for all of Canada in Chapter 4. Temperature influences the timing, duration, and intensity of melt periods, as well as whether precipitation falls as rain or snow. Snowfall events determine the accumulation of seasonal snow, an important reflective and insulating layer, while changes in snow depth influence ice thickness (both lake and sea ice) and ground temperature. 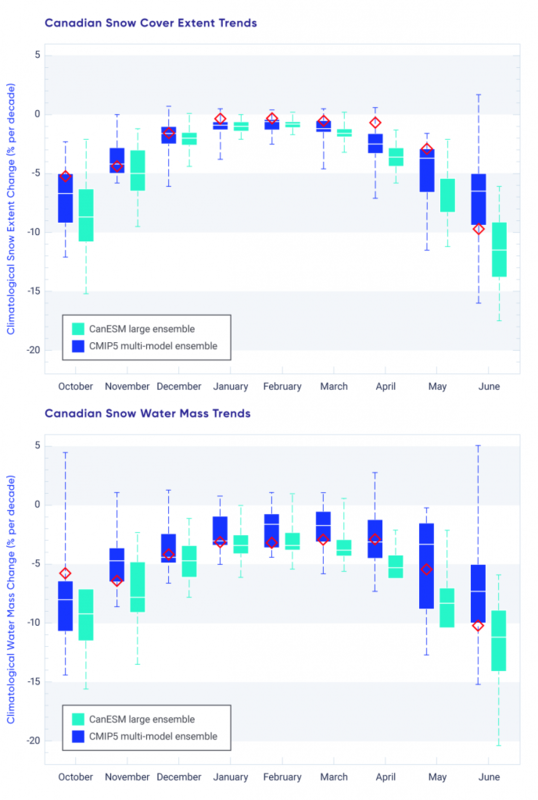 The portion of the year with snow cover decreased across most of Canada (very high confidence) as did the seasonal snow accumulation (medium confidence). Snow cover fraction decreased between 5% and 10% per decade since 1981 due to later snow onset and earlier spring melt. Seasonal snow accumulation decreased by 5% to 10% per decade since 1981 with the exception of southern Saskatchewan, and parts of Alberta and British Columbia (increases of 2% to 5% per decade). Snow cover is a defining characteristic of the Canadian landscape for a few months each winter along the southern margins of the country and for up to nine or 10 months each year in the high Arctic. Snow is responsible for a cascade of interactions and feedbacks that affect the climate system, freshwater availability, vegetation, biogeochemical activity including exchanges of carbon dioxide and trace gases, and ecosystem services (Brown et al., 201726). To understand changes in snow, it is necessary to consider multiple variables, including snow cover fraction (SCF), which is affected by the timing of snow onset and snow melt, and the maximum seasonal snow water equivalent (SWEmax), the amount of water stored by snow and available for melt in spring. These variables affect the exchange of energy between the surface and the atmosphere (with important feedbacks to the global climate system) and freshwater availability, as nearly all Canadian watersheds are snow-dominated in the winter. Snow is critical to winter travel and tourism in many regions of the country and is a key requirement for the construction of winter roads that connect remote communities and mines, particularly in the Northwest Territories, northern Manitoba, and northern Ontario. Surface observations of snow depth from climate monitoring stations (such observations are referred to as “in situ data”) are not well suited for detecting trends and variability in snow cover because they measure snow only at individual points (Brown and Braaten, 199820). Snow depth can vary significantly at the local scale because of interactions with vegetation and topography (typically driven by winds), which means single point measurements may not capture the mean snow depth on the landscape (Neumann et al., 2006123). In addition, climate stations are exceptionally sparse above 55° north latitude in Canada and are biased to lower elevations in mountainous areas and in coastal areas in the sub-Arctic and Arctic. It is, therefore, challenging to use the conventional Canadian climate observing network for a national-scale assessment of snow. Satellite observations and land surface models are available that provide daily, spatially continuous data across all of Canada, extending back for decades. These products have a coarse spatial resolution (25–50 km), which presents problems for alpine areas and regions with mixed land cover. Researchers have made significant efforts to determine the agreement among datasets to ensure robust analysis of trends (Mudryk et al., 2018113). Based on an analysis of multiple datasets covering 1981–2015, SCF (characterized as the proportion of days within each month that snow was present on the ground) decreased by 5% to 10% across most of Canada during most seasons (Mudryk et al., 2018113; see Figure 5.2), notably, for eastern Canada in spring (April/May/June) and most of the Canadian land area in the fall (October/November/December). This loss of snow cover is consistent with previous studies using in situ datasets covering a longer time period (Brown and Braaten, 199820; Vincent et al., 2015189), but the 1981–2015 period is characterized by stronger reductions in snow cover during the snow onset period for eastern Canada in response to enhanced fall warming (consistent with Brown et al., 201825). Decreasing SCF trends over high latitudes of Canada are consistent with documented reductions in annual snow cover duration (SCD; the number of days with snow cover) across circumpolar Arctic land areas of two to four days per decade (approximately 1% to 2% per decade, assuming 250 days mean snow cover) (Brown et al., 201726). Some studies (Derksen and Brown, 201236; Derksen et al., 201637; Brutel-Vuilmet et al., 201327; Hernández-Henríquez et al., 201568; Mudryk et al., 2017115) identified spring snow cover losses slightly stronger than those in Figure 5.2, because different datasets and time periods were considered. Despite these differences, all studies consistently show reductions in spring SCF. Analysis of surface temperature from a blend of six atmospheric reanalysis datasets showed that warming trends over the 1981–2015 period are found in all Canadian land areas with SCF reductions (Mudryk et al., 2018113). Cooling trends in winter and spring are associated with the regions of increasing SCF (see Figure 5.2). Observations from climate stations in the regions where SCF trends increased over 1981–2015 also show decreased maximum snow depth and SCD over the longer 1950–2012 period (Vincent et al., 2015189), so the positive trends over 1981–2015 reflect nature variability in regional surface temperatures and precipitation. While SCF information is important for identifying changes in where snow covers the ground, from a water-resources perspective, it is important to understand how much water is stored in the form of snow. This is determined from the pre-melt SWEmax. SWEmax declined by 5% to 10% across much of Canada during the period 1981–2015, according to the multi-dataset analysis shown in Figure 5.3 (Mudryk et al., 2018113). This is consistent with snow depth trends from surface measurements (Brown and Braaten, 199820; Vincent at al., 2015189) and other observational studies (for example, Mudryk et al., 2015114). Increases in SWEmax are evident across parts of British Columbia, Alberta, and southern Saskatchewan. The influences of temperature and precipitation changes need to be separated to understand the driving mechanisms behind trends in SWEmax (Raisanen, 2008141; Brown and Mote, 200924; Mankin and Diffenbaugh, 2014106; Sospedra-Alfonso and Merryfield, 2017166). Projections of surface temperatures across Canada for the near-term under a high emission scenario (RCP8.5) show warming in all seasons in the multi-model average (see Chapter 4, Section 4.2.1.3), with concurrent decreases in projected SCF across all of Canada during all seasons (Figure 5.4; Mudryk et al., 2018113). During winter, projected snow cover reductions will be greatest across southern Canada, where temperature increases result in less snowfall as a proportion of the total precipitation. Temperatures will remain sufficiently cold at higher latitudes that winter (January/February/March) SCF in this region is not projected to change in response to warming. During spring, the region of snow sensitivity to temperature forcing is projected to shift north, as snow cover retreats across the boreal forest, sub-Arctic, and high Arctic. This leads to projected negative SCF trends (loss of snow) across these regions during the April through June period. Important differences in spring snow cover projections between emissions scenarios emerge by the end of the century, with stabilized snow loss under a medium emission scenario (RCP4.5) but continued loss under a high emission scenario (RCP8.5) (Brown et al., 201726). Projected changes in SWEmax indicate that reductions will be extensive (5% to 10% per decade through 2050, or a cumulative loss of 15% to 30% over the entire 2020–2050 period) over much of southern Canada, with the greatest changes in the Maritimes and British Columbia (see Figure 5.5). The decreases across the prairies, Ontario, Quebec, and the Maritimes are attributable to increasing temperatures that will shift the proportion of total precipitation that currently falls as snow toward rain (Sospedra-Alfonso and Merryfield, 2017166). 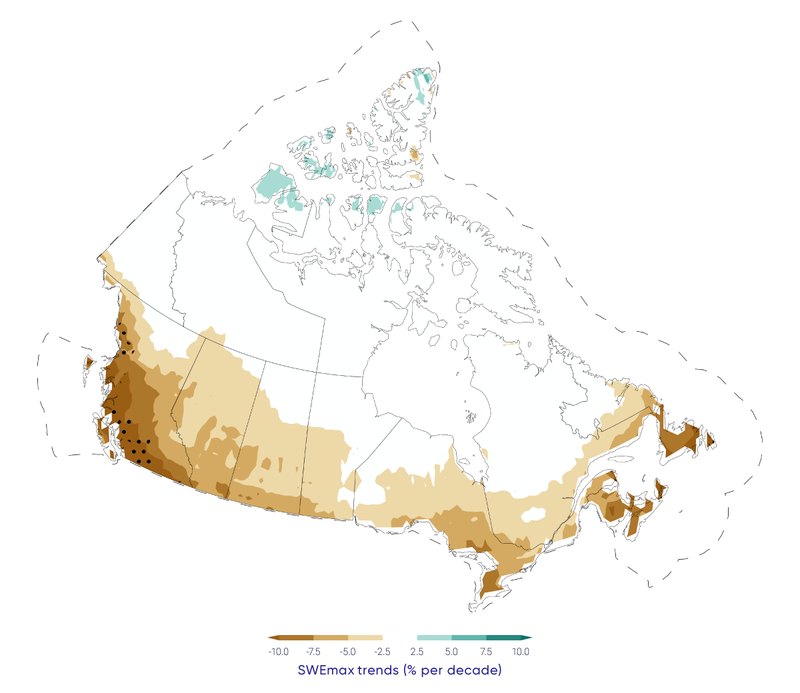 (Note that the greatest near-term reductions in SWEmax, according to the climate model projections, will be just south of the Canadian border.) Projected changes in British Columbia are consistent with projected SWEmax reductions in the Western Cordillera (Fyfe et al., 201750). While SWEmax is projected to increase by mid-century in the Eurasian Arctic (Brown et al., 201726), minimal change is projected across high-latitude land areas of Canada because increased snowfall is expected to be offset by increasing temperatures that shorten the snow accumulation season. The greatest snow loss across Canada during the 2020–2050 period is projected to occur in the shoulder seasons (October–November and May–June; Thackeray et al., 2016179) (see Figure 5.6). During mid-winter, there is minimal percentage change in projected snow cover extent because winter temperatures across northern regions of Canada will remain cold enough to sustain snow cover and there is greater climatological snow extent in winter, which results in smaller percentage changes (see Figure 5.5). The projected trends are similar to the rate of change already observed during the historical period (see Section 5.2.1). Trends from a large ensemble of simulations from the Canadian Earth System Model (CanESM2) are slightly stronger than the CMIP5 multi-model mean because projected warming is greater in CanESM2 than in the CMIP5 multi-model mean (Thackeray et al., 2016179). In summary, analysis of multiple sources of SCF data from satellite remote sensing and land surface models over the 1981–2015 period show the portion of the year with snow cover decreased across Canada at a rate of 5% to 10% per decade. There is very high confidence in these trends based on consistency among multiple datasets and quantitative relationships with surface temperature trends in which there is also high confidence (see Chapter 4). 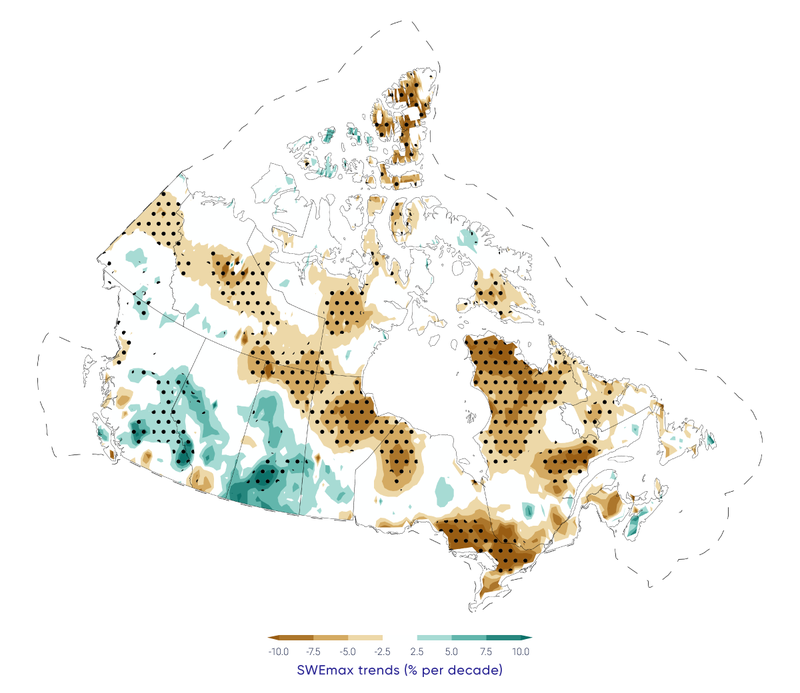 Seasonal snow accumulation decreased by a rate of 5% to 10% per decade across most of Canada (1981–2015), with the exception of southern Saskatchewan, Alberta, and British Columbia (increases of 2% to 5% per decade), driven by both temperature and precipitation changes. Because of greater uncertainty in sources of data on snow accumulation (compared to those on SCF), we have medium confidence in these trends. It is very likely that snow cover duration will decline to mid-century across Canada as a result of increases in surface air temperature under all emission scenarios. This likelihood assessment is based on the strongly established sensitivity of snow cover to surface temperature in both observations and climate models. Scenario-based differences in projected spring snow cover emerge by the end of the century, with stabilized snow loss for low and medium emission scenarios (RCP2.6 and RCP4.5) but continued snow loss under a high emission scenario (RCP8.5). A reduction of 5% to 10% per decade in seasonal snow accumulation (through 2050) is projected across much of southern Canada; only small changes in snow accumulation are projected across northern regions of Canada because increases in winter precipitation are expected to offset a shorter snow accumulation period. There is greater uncertainty in SWE projections (compared to SCD) because of greater spread in climate model responses due to the competing effects of temperature and precipitation, so there is medium confidence in these results. Climate-driven changes to sea ice affect local ecosystems throughout Arctic Canada and influence northern residents through impacts on travelling, hunting, and fishing, with implications for people’s lives, livelihoods, cultural practices, and economic activities. Satellite data show dramatic changes in Arctic sea ice cover during the past 40 years, which are unprecedented over the past 150 years (Walsh et al., 2017190). The once-dominant ice that lasts over at least one complete summer melt season (multi-year ice, MYI) in the Arctic Ocean has been largely replaced by ice that melts completely during the summer (seasonal first-year ice, FYI) (Maslanik et al., 2011109; Comiso, 201233). This change is important because FYI drifts and melts more readily (Tandon et al., 2018176; Stroeve et al., 2012169). Average ice thickness over the Arctic Ocean has decreased considerably (Kwok and Rothrock, 200996; Haas et al., 201066; Laxon et al., 2013102; Richter-Menge and Farrell, 2013142; Kwok and Cunningham, 201595; Tilling et al., 2015181). Since 2007, a series of new record-low Arctic sea ice extents have been recorded in the month of September (when sea ice extent reaches the annual minimum), with a loss rate of approximately 13% per decade relative to the 1981–2010 mean (nsidc.org/arcticseaicenews/; Stroeve et al. 2012169). Concurrent with these changes in ice cover, shipping activity in Canadian Arctic waters has increased over the past decade (Pizzolato et al., 2016134; Dawson et al., 201835). Decreases in sea ice extent are no longer confined to the months of low ice cover (August/September/October), but are now also observed during the once-stable winter season (Serreze et al. 2007151; Parkinson, 2014128). Estimates of total ice and MYI area within Canadian Arctic waters are available from the Canadian Ice Service Digital Archive (CISDA), which is an integration of a variety of datasets, including satellite measurements, surface observations, airborne and ship reports, and operational model results (see Canadian Ice Service, 200730 and Tivy et al., 2011a182 for complete details). This record has been shown to provide more accurate estimates of sea ice concentration (SIC) in Canadian waters compared to satellite passive microwave estimates (Agnew and Howell, 20032). Analysis of seasonally averaged trends in SIC over the 1981–2015 period (selected to match the period of snow datasets described in Section 5.2.1) found reductions over Canadian waters in all seasons (see Figure 5.2). Regions with the strongest SIC declines were eastern Canadian waters in winter and spring, and the CAA and Hudson Bay in summer and fall. SIC trend patterns are closely associated with warming patterns during the seasons of ice onset and growth (from October through March). However, dynamic effects (such as wind, which redistributes sea ice) also influence the observed ice reductions in spring and summer (Mudryk et al., 2018113). The CISDA archive also extends the record of total and MYI back to 1968, almost 10 years earlier than coverage by satellite passive microwave observations. Between 1968 and 2016, sea ice area, averaged over the summer period, has decreased significantly in almost every region of the Canadian Arctic, by up to 20% per decade in some regions (e.g., the Hudson Strait and Labrador Sea; see Figure 5.7). Compared with trends computed over the periods 1968–2008 (Tivy et al., 2011a182) and 1968–2010 (Derksen et al., 201236), more regions are now experiencing significant decreases, and the rate of decline is stronger in all regions except Hudson Bay. The largest declines in MYI have occurred in the CAA (approximately 9% per decade) and Beaufort Sea (approximately 7% per decade). While there are high year-to-year differences due to natural variability, time series of sea ice area (see Figure 5.8) clearly show negative trends. The Beaufort Sea experienced record-low sea ice area in 2012, becoming virtually ice free near the end of the melt season (Figure 5.8a; Babb et al., 20168). This was nearly repeated in 2016. The CAA had record-low ice years in 2011 and 2012, eclipsing the previous record set in 1998 (Figure 5.8b; Howell et al., 201375). Baffin Bay has experienced consistently low sea ice area since 1999 (Figure 5.8c), while Hudson Bay sea ice area has declined since the mid-1990s (see Figure 5.8d; Tivy et al., 2011b183; Hochheim and Barber, 201469). Modelling has demonstrated that the recent extreme lows in Arctic SIC would not have occurred without anthropogenic climate change (see Box 5.1). The Arctic experienced a record-low sea ice extent (SIE) in September 2012. Extreme low SIEs can have impacts on Arctic communities, ecosystems, and economic activities. Determining the role of human-induced climate change in extreme low Arctic SIEs is important, because understanding the role of anthropogenic greenhouse gases compared to natural variability provides a basis for understanding future projections and potential adaptation measures. Event attribution methods are used to determine the influence of human-induced climate change on the occurrence (or intensity) of extreme events (NASEM, 2016121). The probability of a particular extreme event is compared between two different sets of climate model simulations: those that include the contribution from human activities and those that include only natural factors. The difference in these probabilities indicates the effect of human-induced climate change on the event. Attribution studies are described in more detail in Chapter 4, Section 4.4. Increasing temperatures in the Arctic have been attributed to human-induced factors in many studies (Gillett et al., 200856; Najafi et al., 2015119; Min et al., 2008111). Furthermore, attribution studies show that the record-low SIE in 2012 was extremely unlikely to be due to natural variability in the climate system alone (Zhang and Knutson, 2013198) and that it would not have occurred without human influence on climate (Kirchmeier-Young et al., 201782). 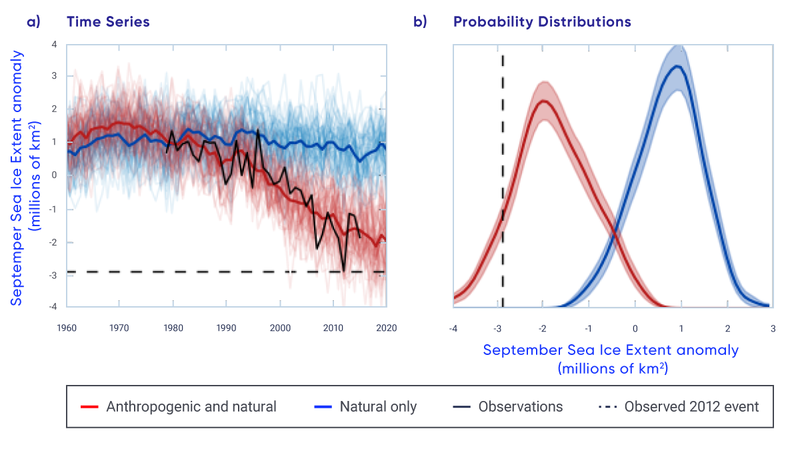 Figure 5.9a shows September Arctic SIE over time from climate model simulations using only natural factors (blue line) and simulations that also include the human-induced component (red line). Simulations that include the human-induced component show a strong decreasing trend, similar to the observed decline in SIE (black line). On the other hand, the simulations with only natural forcings show similar year-to-year variability but no trend. To compare the probability of the 2012 event from each set of simulations, probability distributions are shown in Figure 5.9b. The distributions describe possible values that might be expected in each scenario and how likely they are. The observed 2012 record-low SIE event (vertical dashed line) is within the distribution from the simulations that include the human-induced component and is much lower than any values in the distribution with only natural forcings. With the human-induced component included, there is a 10.3% possibility of a September SIE more extreme than the observed 2012 event. For the natural-only simulations, this probability is extremely small. Therefore, the record-low September SIE in 2012 was extremely unlikely to be due to only natural variability of the climate and would not have occurred without the human influence on climate (Kirchmeier-Young et al., 201782). The decline of sea ice across the Canadian Arctic is driven by increasing spring air temperature and resulting increases in the length of the melt season. This results in more open water, increased absorption of solar radiation (which further contributes to ice melt), increased water temperature, and delayed fall freeze-up (Howell et al., 2009a73; Tivy et al., 2011a182; Stroeve et al., 2014168; Parkinson, 2014128). Changes in sea ice cover are also driven by atmospheric circulation. The Beaufort Sea was once a region where ice would thicken and age before being transported to the Chukchi Sea and recirculated in the Arctic (Tucker et al., 2001185; Rigor et al., 2002143), but now the region has become a considerable contributor to the Arctic’s MYI loss (Kwok and Cunningham, 201094; Maslanik et al., 2011109; Krishfield et al., 201493; Galley et al., 201652). Ice is still being sequestered from the Canada Basin (one of the two ocean basins in the Arctic Ocean) and transported through the Beaufort Sea during the summer months, but this ice is now younger and thinner and melts en route to the Chukchi Sea (Howell et al., 2016a70). The CAA was also a region with historically heavy MYI throughout the melt season, but MYI conditions have become lighter in recent years (see Figure 5.7; Howell et al., 201572). Arctic sea ice thickness has declined in recent years, largely associated with a reduction and thinning of the MYI fraction (e.g., Kwok and Rothrock, 200996; Haas et al., 201066; Laxon et al., 2013102; Richter-Menge and Farrell, 2013142; Kwok and Cunningham, 201595; Tilling et al., 2015181). These studies indicate thickness declines are greater in the Beaufort Sea compared with the north-facing coast of the CAA, which still contains some of the thickest sea ice in the world (Haas and Howell, 201565). Unfortunately, the spaceborne sensors used to obtain sea ice thickness information over the Arctic Ocean are not of sufficient spatial resolution to provide thickness estimates within the narrow channels of the CAA. Although there are only four locations with consistent records and point measurements may not capture regionally representative conditions, the Canadian Ice Service record of in situ landfast ice thickness represents one of the longest datasets in the Arctic, spanning over five decades. Maximum ice thickness has declined significantly at three sites in the CAA (Cambridge Bay, Eureka, and Alert), with decreases ranging from 3.6 to 5.1 cm (± 1.7 cm) per decade from the late 1950s to 2016 (Howell et al., 2016b74). No significant trend was found at Resolute, a result that differs from an earlier study by Brown and Cote (1992), which reported a significant increase in maximum ice thickness at Resolute over the 1950–1989 period. Sea ice along the east coast of Canada is seasonal, with ice melting completely each spring. A robust indicator of change is winter season sea ice area, defined as the average from January through March of each year. The rate of decline between 1969 and 2016, determined from the CISDA for the entire east coast region, is 7.5% per decade (statistically significant at the 1% level; there is only a 1% possibility that the decline is due to chance; see Figure 5.10). This is consistent with the passive microwave time series, which indicates a decline of 9.5% per decade over the 1979–2015 period (Peng and Meier, 2017130). 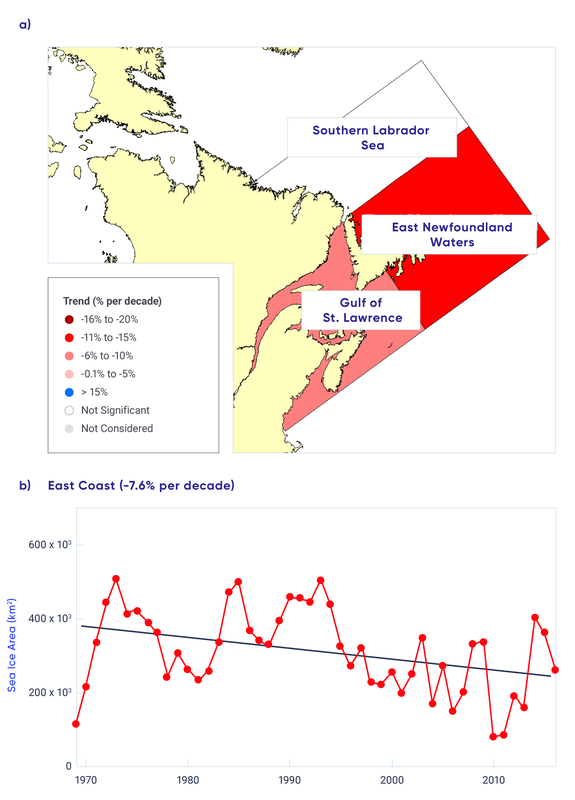 There is regional variability within the east coast region, as the rate of decline for the Gulf of St. Lawrence (8.3% per decade) is less than that for eastern Newfoundland waters (10.6% per decade), while the decline for the southern Labrador Sea is not statistically significant at the 5% level (there is a possibility of more than 5% that the decline is due to chance; see Figure 5.10). Years with extensive ice cover are more prominent before 1995, but the region has experienced recent heavy ice years as well (in 2014 and 2015). Sea ice variability in this region is driven largely by temperature and atmospheric circulation (i.e., winds) associated with the Arctic Oscillation (also called the Northern Annular Mode [see Chapter 2, Box 2.5]; Deser and Tang, 200839; Peterson et al., 2015133). The narrow channels in Canadian Arctic waters are poorly represented by the coarse spatial resolution of climate models. While uncertainty in model projections is therefore higher for the CAA than for the pan-Arctic, evaluation of historical simulations shows the CMIP5 multi-model ensemble (see Chapter 3, Box 3.1) still provides a quantitative basis for projecting future sea ice conditions (Laliberté et al., 201697). Under a high emission scenario (RCP8.5), the CMIP5 multi-model projections indicate widespread reductions in SIC for the ice melt (summer) and ice formation (fall) seasons (Mudryk et al., 2018113; see Figure 5.4). For the east coast, virtually ice-free conditions during the winter months are projected by mid-century under a high emission scenario (RCP8.5) with uncertainty in these projections due to potential changes in the transport of sea ice from the Arctic to the east coast (Loder et al., 2015104). The probability and timing of future sea ice–free conditions are sensitive to the definition of ‘ice-free’ (Laliberté et al., 201697). When using a threshold of 5% ice area, there is a 50% probability that all Canadian regions will be sea ice–free in September by 2050 under a high emission scenario (RCP8.5; see Figure 5.11). The probability that all regions will be ice free is similar for August, but lower for October and November. Hudson Bay, which is already largely ice free in August and September, has a high probability of being ice free for four consecutive months (August through November) by 2050. Using a definition of 30% ice area, more persistent ice-free conditions are projected. 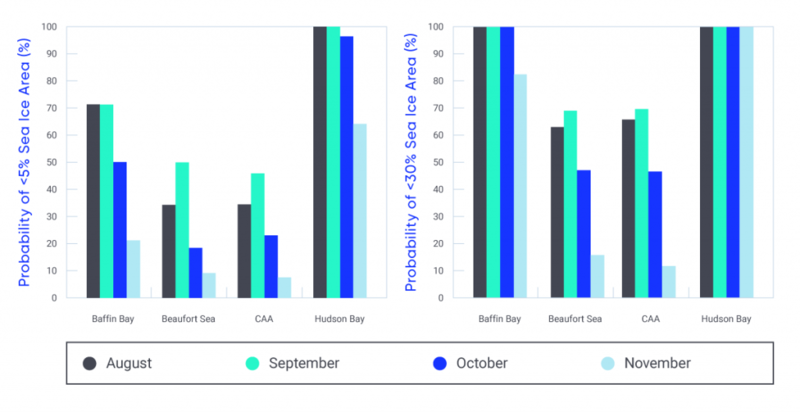 Baffin Bay is projected to be ice free for August through October, and the Beaufort Sea and the CAA may be ice free in August and September by 2050. The likelihood of summer ice-free conditions in the central Arctic is connected to the magnitude of projected global temperature increases, with a much greater probability of ice-free conditions for 2°C global warming compared to 1.5°C (Jahn, 201878; Sigmond et al., 2018156). The area to the north of the CAA and Greenland will be the last refuge for summer sea ice (including MYI) in the Arctic during the summer (Wang and Overland, 2012193; Laliberté et al., 201697), so ice will still drift into the Northwest Passage, where it will present a navigation hazard for shipping, even when the Arctic Ocean is sea ice–free during the summer (see FAQ 5.1: Where will the last ice area be in the Arctic?). Where will the last sea ice area be in the Arctic? The decline of summer Arctic sea ice extent associated with observed warmer temperatures is perhaps the most visible feature of climate change over the past 30 years or more (Comiso, 201233; Fyfe et al., 201351). Arctic sea ice is also thinner because older and thicker MYI has been gradually replaced by younger seasonal ice (Kwok and Cunningham, 201595). Continued declines in both sea ice extent and thickness as a result of further warming from greenhouse gas emissions are projected by the latest state-of-the-art climate models, and this has led to questions about when the Arctic will become free of sea ice during the summer months. The consensus from climate models is that a summertime sea ice–free Arctic could be a reality under a high emissions scenario by mid-century; however, there is considerable regional variability in the timing of projected sea ice–free conditions during the summer months (Laliberté et al., 201697). The “last ice area” (LIA) refers to regions of the Arctic immediately north of Greenland and the CAA, as well as areas between the northern islands of the CAA (Figure 5.12). The concept of the LIA was borne from climate model simulations that project sea ice within the LIA, even when the rest of the Arctic is virtually sea ice–free during September (Laliberté et al., 201697). Sea ice will persist in the LIA because of the influence of large-scale atmospheric circulation (prevailing winds) on sea ice motion, with the atmospheric Beaufort High driving the counter-clockwise (anti-cyclonic) movement of sea ice in the Beaufort Gyre. As a result, Arctic Ocean sea ice converges against the northern coasts of Greenland and the CAA, creating some the thickest sea ice in the world, with some floes over 5 m thick (Kwok and Cunningham, 201595). This thick sea ice is more resistant to melt under a warming Arctic. So, assuming no major changes in future atmospheric circulation patterns, sea ice will persist in the LIA during the summer, even when the rest of the Arctic is sea ice–free. Recent scientific attention, in the context of the Paris Agreement under the United Nations Framework Convention on Climate Change, has focused on the probability that the Arctic will become sea ice–free in the summer. The Paris Agreement aims to strengthen the global response to climate change by limiting the increase in global mean temperature to within 2°C above pre-industrial levels, while pursuing efforts to limit warming even more, to 1.5°C. Climate model simulations show that a sea ice–free Arctic becomes increasingly more likely as global mean temperatures increase beyond 1.5°C and reach 2°C (e.g., Jahn, 201878; Sigmond et al., 2018156). These studies define sea ice–free conditions for the Arctic as a threshold of 1 million km2 sea ice extent; this remnant ice cover will be located in the LIA. The LIA will be an important refuge for marine species who rely on sea ice for habitat and hunting, as well as for communities that depend on these species. The persistence of sea ice within the LIA has implications for shipping in the Arctic. 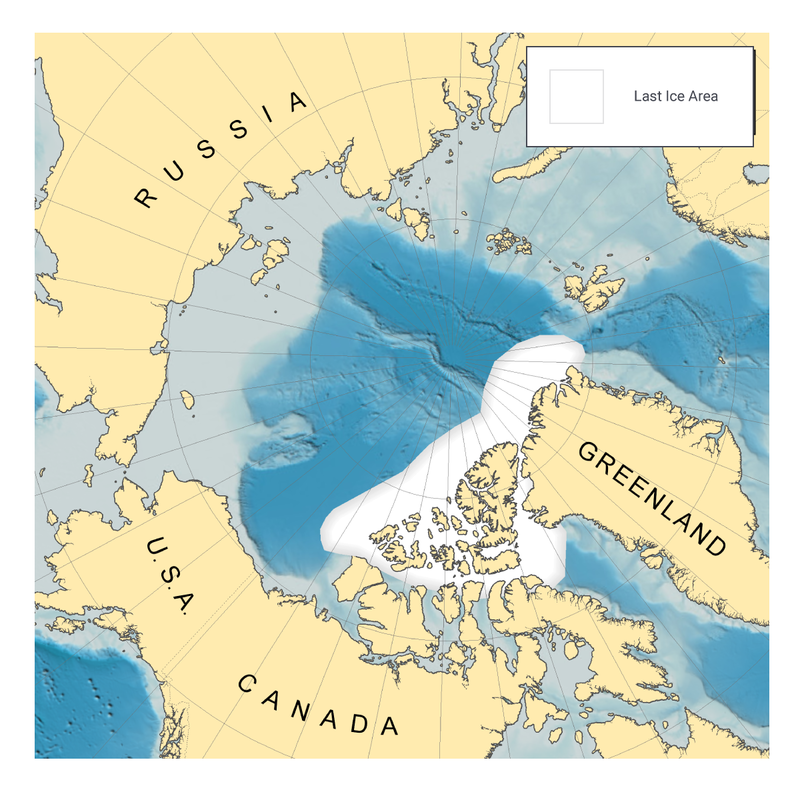 For instance, even when the majority of the Arctic is sea ice–free during the summer, thick multi-year ice from the LIA will continue to be transported southward into the channels of the Northwest Passage, presenting a hazard to transiting ships (Haas and Howell, 201565). In summary, the Arctic sea ice environment has changed profoundly over recent decades (Barber et al., 201710). Perennial sea ice that survives the summer melt is being replaced by thinner seasonal sea ice that melts in the summer. Summer sea ice area (particularly MYI) declined across the Canadian Arctic by 5% to 20% per decade (1968–2016, depending on region); winter sea ice area decreased in eastern Canada (by 7.6% per decade, 1969–2016). There is very high confidence in these trends, which are derived by trained analysts from Canadian Ice Service ice charts that provide region-specific sea ice information. It is very likely that continued reductions in summer and fall sea ice across the Canadian Arctic, and winter sea ice in eastern Canadian waters, will result from increased temperatures under all emission scenarios. Most Canadian Arctic marine regions could be sea ice–free for at least one month in the summer by 2050 (high confidence) based on simulations from CMIP5 models. There is very high confidence that the region to the north of the CAA and Greenland will be the last area where thick MYI will be present in the Arctic during the summer. Current understanding of sea ice dynamics, based on satellite observations, indicates this MYI will continue to drift into Canadian waters. Canada’s landmass supports approximately 200,000 km2 of ice, which includes glaciers and ice caps in western Canada, the Canadian Arctic Archipelago (CAA), and northern Labrador (Radic et al., 2014140; Clarke et al., 201532). These glaciers are responding to long-term climate changes since the Little Ice Age, as well as the anthropogenic rapid warming of recent decades. The largest ice caps are located in Queen Elizabeth Islands and Baffin Island of the Canadian Arctic. Because they drain to the Arctic Ocean, these ice caps represent the greatest potential contribution from Canadian territory to sea level increases (Radic et al., 2014140). Mountain glaciers of western Canada cover a much smaller area and have less potential to affect global sea levels. However, they are an important source of meltwater runoff, as melt from these glaciers is a significant contributor to summer streamflow in river systems (Jost et al., 201281; Naz et al., 2014122; Bash and Marshall, 201413). The loss of mountain glaciers can therefore influence how much water is available, and when, in downstream areas that can extend far from the source regions. A key measure of health for glaciers and ice caps is surface mass balance, the difference between annual mass gained through snow accumulation and mass lost due to melt runoff. In the relatively dry Canadian Arctic, surface mass balance is determined primarily by the duration and intensity of the summer melt season (Koerner, 200585), while glaciers in more temperate regions of Canada are also influenced significantly by year-to-year variations in snowfall. Remote sensing measurements generally cannot be used to directly estimate mass balance, with the exception of very coarse resolution gravimetric measurements from the NASA GRACE mission (approximately 450 km × 450 km), but remote sensing does contribute valuable information on the melt/freeze state (Wang et al., 2005192), changes in ice thickness (Gray et al., 201659; Krabill et al., 200292; Berthier et al., 201418), and glacier motion and iceberg calving (Strozzi et al., 2008170, van Wychen et al., 2016186, Gray et al., 200160). For larger regions, models can be used to estimate mass balance (Lenaerts et al., 2013103; Gardner et al., 201154). Long-term records of surface mass balance measurements from a small number of Canadian glaciers are available through the World Glacier Monitoring Service (<http://wgms.ch/latest-glacier-mass-balance-data/>). Acquiring surface measurements for the determination of glacier mass balance is logistically difficult, so only selected glaciers in the CAA and western Cordillera are monitored (see Figure 5.13). Climate warming, combined with periods of reduced precipitation in Western Canada, has contributed to total thinning of glaciers in the southern Cordillera by 30 to 50 m since the early 1980s (see Figure 5.13) (Zemp et al., 2015197). By the mid-1980s, glaciers in Garibaldi Provincial Park, southern British Columbia, had contracted in area by 208 km2 since the Little Ice Age maximum extent of 505 km2, with accelerated shrinkage by another 52 km2 (or 7% of the Little Ice Age maximum) by 2005 (Koch et al., 200984). Glacier extent at several sites in the central and southern Canadian Rocky Mountains decreased by approximately 40% from 1919 to 2006 (Tennant et al., 2012178). Glaciers of the Columbia Icefield, in the Canadian Rocky Mountains, also experienced dramatic changes from 1919 to 2009, losing 22.5% of total area while retreating more than 1.1 km on average (Tennant and Menounos, 2013177). Aerial photography shows that all glaciers in British Columbia’s Cariboo Mountains receded over the 1952–2005 period, with a loss of approximately 11% in surface area (Beedle et al., 201515). In eastern Canada, small alpine glaciers in the Torngat Mountains, Labrador (see Figure 5.13 for location) shrunk by 27% between 1950 and 2005, with current thinning rates as high as 6 m per year across the 22 km2 of glaciers that remain in this area (Barrand et al., 201712). Mass balance data for Devon (northwest), Meighen, Melville, and all sites in the Western Cordillera are from the Geological Survey of Canada archives, and data for the White Glacier were obtained from Trent University (1960–2012; G. Cogley) and University of Ottawa (2013–2015; L. Copland). Glaciers and ice fields covering approximately 10,000 km2 of the Yukon have decreased in area by approximately 22% between 1957 and 2007, and thinned by 0.78 m water equivalent (90% uncertainty range 0.44 to 1.12 m per year) contributing 1.12 mm (90% uncertainty range 0.63 to 1.61 mm) to global sea level over this period (Barrand and Sharp, 201011). Mass balance of glaciers, measured at three monitoring sites in Alaska (all within 300 km of the Kluane ice field, Yukon) indicate a rapid change from positive to negative glacier mass balance in this region beginning in the late 1980s (Wolken et al., 2017195). Long-term in situ glacier monitoring indicates a trend of significant loss of mass for glaciers and ice caps in the CAA beginning in the early 1990s (see Figure 5.13). Acceleration of glacier thinning in this region in the mid-2000s coincided with increases in summer warming driven by the advection of warm air masses to the Arctic from more southerly latitudes (Sharp et al., 2011154; Mortimer et al., 2016112). Based on satellite measurements and surface mass-budget models, total mass loss from glaciers and ice caps in the CAA has increased more than two-fold, from 22 gigatonnes (Gt) per year between 1995 and 2000 (Abdalati et al., 20041), to 60 Gt per year (90% uncertainty range 52 to 66 Gt per year) over the 2004–2009 period (Gardner et al., 201353), and 67 Gt per year (90% uncertainty range 61 to 73 Gt per year) over the 2003–2010 period (Jacob et al., 201277), with mass losses continuing to accelerate to 2015 (Harig and Simons, 201667). According to the most recent assessments of regional glacier change, glacier melting in the CAA has contributed 0.16 mm per year to global sea-level rise since 1995, 23% of the contribution of the Greenland ice sheet and 75% of the Antarctic Ice Sheet (Gardner et al., 201353; Shepard et al., 2012155; Sharp et al., 2016153). The Barnes Ice Cap on Baffin Island, the last remnant of the Laurentide Ice Sheet that covered most of Canada during the last glaciation, lost 17% of its mass from 1900 to 2010 (Gilbert et al., 201655). Approximately 10% of the total area of ice in the CAA is composed of small, stagnant ice caps (the oldest are less than 3000 years old), located almost entirely under the regional equilibrium line altitude, meaning they do not have an accumulation zone and experience net thinning across their entire area in most years. These ice caps are shrinking rapidly (Serreze et al., 2017152) and fragmenting (Burgess, 201728), with many expected to completely disappear within the next few decades. Of similar age to the small ice caps are the ice shelves of northern Ellesmere Island, which are composed of floating glacier ice and/or very thick old sea ice. These ice shelves have decreased in area by about 90% since 1900 (with more than 50% of that loss since 2003) and are expected to survive for only the next decade or two (Mueller et al., 2017116). Like many glaciers in the world, Canada’s glaciers are out of equilibrium with current climatic conditions and will continue to lose mass for the foreseeable future. Summer warming in the Arctic has driven extreme melting of ice caps and glaciers over the past two decades, resulting in this region becoming the most significant cryosphere contributor to global sea-level rise after the Greenland and Antarctic ice sheets. Climate model projections indicate that western Canada and the western United States together (grouped together in many studies because of their similar mountainous domain) could lose approximately 85% (90% uncertainty range 74% to 96%) of the 2006 volume of glaciers by the end of the century under a medium emission scenario (RCP4.5). Under a high emission scenario (RCP8.5), this loss could exceed 95% (Radic et al., 2014140). Glaciers in the coastal ranges of western Canada are predicted to lose 75% (90% uncertainty range 65% to 85%) of their 2005 ice area and 70% (90% uncertainty range 60% to 80%) of their volume by 2100 based on the mean of four emission scenarios (RCP2.6, 4.5, 6.0, 8.5) (Clarke et al., 201532). Glaciers in the western Canadian interior are projected to lose more than 90% of the 2005 volume under all scenarios except a low emission scenario (RCP2.6) (Clarke et al., 201532). These changes, in combination with the projected loss of alpine snow cover, will impact regional water resources (Fyfe et al., 201750; see Chapter 6, Section 6.2). Glacier-fed rivers may experience periods of increased discharge due to greater meltwater contributions in a warmer climate, but this response is finite, and glacier mass loss associated with warming is projected to result in reduced summer streamflow by mid-century (Clarke et al., 201532). The rate and timing of this transition will have important consequences for stream and river water quality and temperature, and for the availability of water for human uses such as hydro-electricity generation and agriculture. Regional land ice models project that glaciers and ice caps in the Canadian Arctic will lose 18% of their total mass by 2100 (Radic et al., 2014140; relative to a baseline mass reference estimated by Radic and Hock, 2011) under a medium emission scenario (RCP4.5), equivalent to 35 mm of global sea-level rise (Lenaerts et al., 2013103; Marzeion et al., 2012108). This loss of land ice volume in Arctic Canada by 2100 will contribute 41 mm of sea-level equivalent (90% uncertainty range 26 to 56 mm) under RCP4.5, and 57 mm of sea-level equivalent (90% uncertainty range 39 to 75 mm) under a high emission scenario (RCP8.5) (Radic et al., 2014140). Densification of high-elevation firn (partially compacted granular snow that is the intermediate stage between snow and glacial ice) has reduced or eliminated the internal storage capacity of the larger (more than 2000 km2) ice caps in this region, thus increasing their sensitivity to future warming (Noël et al., 2018124). Based on the trajectories of observed loss over recent decades, many of the remaining small ice caps (less than 2000 km2) and ice shelves in the Canadian Arctic are expected to disappear by 2100. In summary, Canada’s Arctic and alpine glaciers have thinned over the past three to five decades, due to increasing surface temperatures (very high confidence). While spatial sampling is sparse, these long-term trends in glacier thickness change have been measured annually following standardized protocols and agree with independent remote sensing and model-based approaches. Multiple assessments using satellite data and models show that mass loss from glaciers and ice caps in the Canadian Arctic represents the largest cryosphere contributor to global sea-level rise after the Greenland and Antarctic ice sheets (very high confidence). Based on a regional mass balance model forced by future climate scenarios, glaciers across the Western Cordillera are projected to lose up to 85% of their volume by the end of the century (high confidence). This will lead to a decline in glacial meltwater supply to rivers and streams, although there is only medium confidence in the absolute impacts on freshwater availability because of multiple other contributors to projected streamflow changes (see Chapter 6, Section 6.2). Based on output from various independent models, glaciers and ice caps in the Canadian Arctic will lose 18% of their total mass by the end of the century, and so will remain important contributors to global sea-level rise beyond 2100 (high confidence). Small ice caps and ice shelves in the Canadian Arctic are shrinking rapidly. Based on observed changes in recent decades, and ice cap and ice shelf sensitivity to projected temperature increases, most are expected to disappear well before 2100 (very high confidence). Canada is a lake-rich country, particularly across the north, with approximately 20% to 25% of the Arctic coastal lowlands covered by lakes (Duguay et al., 200344). Therefore, the timing of lake and river ice freeze-up and breakup (known as ice phenology) and ice thickness are important indicators of climate variability and change. Ice phenology is sensitive to changes in air temperature, whereas changes in ice thickness are linked to changes in both air temperature and snowfall. Due to the insulating properties of snow, the timing of snow accumulation on new ice and the seasonal accumulation of snow influence ice thickness. In situ records of ice cover across much of Canada are limited, because surface-based ice monitoring is not practical in many regions, so satellite remote sensing is commonly used to monitor lake and river ice (Howell et al., 200971). Changes to ice phenology and thickness influence the role that lakes play in regional energy and water cycles (Rouse et al., 2005147). Ice cover also has strong effects on lake biogeochemical processes in cold regions: changes in the ecological productivity of high Arctic lakes on Ellesmere Island are predominantly determined by variations in ice cover duration (Griffiths et al., 201762). Reductions in ice cover may also allow greater emissions of methane (a greenhouse gas) from Arctic lakes (Greene et al., 201461; Tan and Zhuang, 2015175). The importance of ice cover to ecosystems is not limited to the Arctic. For instance, earlier ice melt across the Great Lakes is linked to turbidity and phytoplankton activity through enhanced wind-induced mixing (Bai et al., 20159). Seasonal roads across frozen lakes serve as a critical supply lines to remote communities and mines during winter months, while stable lake and river ice is a necessity for safe winter season recreation and travel for residents of northern communities. Surface observations show that ice breakup is occurring earlier, and freeze onset later, across small lakes in southern Quebec, Ontario, Manitoba, and Saskatchewan (Brown and Duguay, 201022). A significant declining trend in annual maximum ice cover was observed for the Laurentian Great Lakes over the 1973–2010 period (71% decline for all of the Laurentian Great Lakes), with the largest declines occurring in Lake Ontario (88%), Lake Superior (79%), and Lake Michigan (77%) (Wang et al., 2012191). Heavy ice years in 2014, 2015, and 2018, however, result in no trend over the full 1973–2018 period (Figure 5.14). The large year-to-year variation is associated with the Arctic Oscillation/North Atlantic Oscillation (AO/NAO) and El Niño–Southern Oscillation (ENSO) (see Chapter 2, Box 2.5). For example, the record-breaking low in maximum ice cover in the winter of 2011/2012 occurred during a strong positive-phase AO/NAO and the cold phase of ENSO (La Niña event) (Bai et al., 20159). Whether variable ice cover contributes to observed increases in water temperature in the Laurentian Great Lakes is a topic under debate. Recent findings suggest that changes in winter lake ice cover play only a minor role in the observed warming trend (Zhong et al., 2016202), whereas ice cover duration was linked to summer surface water temperature (particularly in nearshore areas) when the lakes were examined at a finer spatial scale (Mason et al., 2016110). 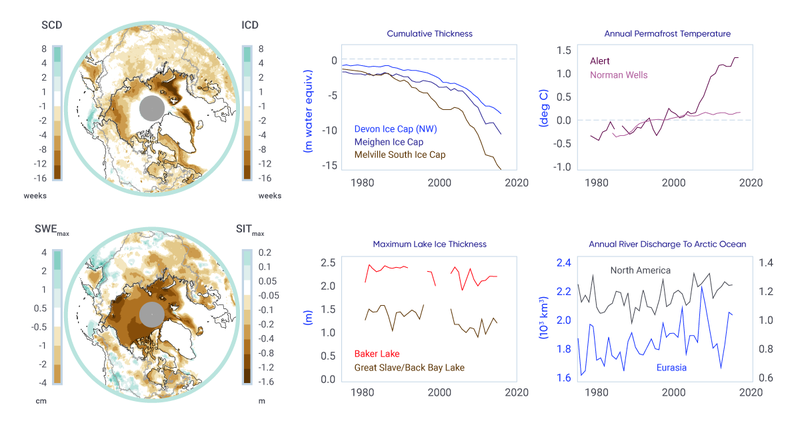 Satellite measurements show that lakes in Arctic Canada have also been experiencing an earlier ice minimum (the last date of floating ice cover on the lake surface) and an earlier date when the water is clear of ice (see Figure 5.15; see also Duguay et al., 200645; Prowse, 2012135; Cooley and Pavelsky, 201634). These changes are consistent with a recent circumpolar assessment, which showed that approximately 80% of Arctic lakes experienced declines in ice cover duration from 2002 to 2015, due to both a later freeze-up and an earlier breakup (Du et al., 201741). Results from northern Alaska (which are likely similar to those in northwestern Canada) show that lake ice has begun to thin in recent decades (Alexeev et al., 20163). From 1992 to 2011, approximately one-third of shallow lakes in which the entire water volume historically froze to the bed by the end of winter had changed to floating ice (Arp et al., 20127; Surdu et al., 2014173). Canada’s northernmost lake, Ward Hunt Lake (located on Ward Hunt Island), had maintained stable, continuous year-round ice cover for many decades until very warm summers of 2011 and 2012, when the ice cover fully melted (Paquette et al., 2015127). This loss of inland perennial freshwater ice cover occurred nearly simultaneously with the collapse of the nearby Ward Hunt ice shelf (Mueller et al., 2009117; Veillette et al., 2010188). Analysis of a 15-year time series (1997–2011) of radar and optical satellite imagery provides further evidence that some lakes in the central and eastern Canadian high Arctic are transitioning from continuous (year-round) to seasonal ice cover (Surdu et al., 2016174). It is difficult to provide an assessment of river ice changes across Canada because of sparse observations and a lack of recent assessments of the available data. There is evidence of earlier river ice breakup, consistent with increases in surface temperature (Prowse, 2012135). However, the impact that climate-driven changes in ice phenology and thickness, combined with changing seasonal flow regimes (see Chapter 6, Section 6.2) and the influence of hydraulic processes (i.e., changing ice strength), will have on ice jams and flood events is not fully understood (Beltaos and Prowse, 200916). Changes in lake ice can be projected only indirectly, because lake models are not embedded within global climate models and individual lakes are not spatially resolved. When forced by a future climate under a medium emission scenario (RCP4.5), lake ice models project that spring breakup will occur between 10 and 25 days earlier by mid-century (compared with 1961–1990), and freeze-up will be five to 15 days later across Canada (Brown and Duguay, 201123; Dibike et al., 201240) (Figure 5.16). This results in a reduction of ice cover duration of 15 to 40 days for much of the country. More extreme reductions of up to 60 days are projected in coastal regions. The range in projected changes is due to regional variability in temperature and snowfall changes, and to lake-specific variables such as size and depth. The Laurentian Great Lakes can be resolved by lake models if the projected climate forcing data are downscaled. This approach has identified consistent results, with reduced ice cover duration of between 25 to 50 days across the Laurentian Great Lakes by mid-century, due to both later freeze-up and earlier melt (Gula and Peltier, 201263). Mean seasonal maximum ice thickness is projected to decrease by 10 to 50 cm by mid-century, with a more pronounced decrease in the eastern Canadian high Arctic (Brown and Duguay, 201123). Warming is projected to drive an earlier river ice breakup in spring, which is due to decreased mechanical ice strength and earlier onset of peak discharge (Cooley and Pavelsky, 201634). More frequent mid-winter breakup and associated ice jam events are anticipated (Beltaos and Prowse, 200916), although projected changes in river ice properties may reduce ice obstructions during the passage of the spring freshet (the increased flow resulting from snow and ice melt in the spring) (Prowse et al., 2010137). A shorter ice cover season and reduced ice thickness may affect food security for northern communities by reducing the reliability of traditional ice-based hunting routes and the safety of ice-based travel. The reliability and predictability of ice roads as supply lines to northern communities and development sites is not fully dependent on climate, because these ice roads are partially engineered each season (i.e., snow is removed to accelerate ice growth). However, there have been instances of severely curtailed ice-road shipping seasons due to unusually warm conditions in the early winter (Sturm et al., 2016171). The seasonal operational duration for such ice roads is expected to decrease as a result of winter warming (Perrin et al., 2015132; Mullan et al., 2017118). In summary, the duration of seasonal lake ice cover is declining across Canada due to later ice formation in fall and earlier spring breakup, with implications for freshwater ecosystem services, tourism and recreation, and transportation. Although the surface monitoring network is sparse, there is high confidence in this trend because of consistency between satellite observations and historical lake ice model simulations. There is a weak negative trend in seasonal maximum lake ice cover for the Laurentian Great Lakes (1971–2017); large year-to-year variation is the primary feature of the time series (very high confidence). Changes in lake ice are difficult to project because lake models are not embedded within global climate models and individual lakes are not spatially resolved. Instead, estimates of changing lake ice phenology are derived from lake ice models forced by projected future climates. These simulations indicate spring lake ice breakup will be 10 to 25 days earlier by mid-century, with a five to 15-day delay in fall freeze-up, depending on the emission scenario. While the impact of warming temperatures on ice phenology is clear, there is only medium confidence in these projections because of numerous sources of uncertainty, including the quality of snowfall projections, the limitations of lake ice models, and the role of lake-specific characteristics such as depth and morphology. Understanding current permafrost conditions and how they may evolve in response to a changing climate is essential for the assessment of climate change impacts and the development of adaptation strategies in northern Canada. Permafrost conditions are linked to hydrological (e.g., drainage) and land surface processes (e.g., erosion and slope movements); ground warming and thawing can therefore affect ecosystems. Thawing of ice-rich permafrost results in ground instability; if not considered in the design phase, this can affect the integrity of infrastructure such as buildings and airstrips. Coastal communities face unique challenges because of processes related to thawing of the shore face (Ford et al., 201648). The northern circumpolar permafrost region holds reserves of carbon (approximately 1000 petagrams [Pg] in the upper 3 m) as large as the total amount of carbon in the atmosphere (Hugelius et al., 201476; Olefeldt et al., 2016126). If permafrost thaws, it could therefore release massive amounts of greenhouse gases (carbon dioxide and methane) into the atmosphere (Romanovsky et al., 2017a144). Northern soils efficiently store mercury, which is vulnerable to release as a consequence of permafrost thaw (Schuster et al., 2018149). Permafrost thawing can also release other compounds and dissolved material (e.g., Kokelj and Jorgenson, 201386; Kokelj et al., 201387), including contaminants associated with waste facilities that may depend on permafrost for containment (e.g., Prowse et al., 2009136; Thienpont et al., 2013181). Permafrost conditions are challenging to monitor because they cannot be directly determined using satellite measurements. They are therefore determined largely from in situ monitoring, which results in gaps in the spatial distribution of measurement sites because of the relative inaccessibility of large portions of northern Canada and historical emphasis in monitoring regions with infrastructure development potential (such as the Mackenzie Valley; Smith et al., 2010163). Changes in permafrost conditions over the last few decades can be assessed by tracking changes in two key indicators: permafrost temperature and thickness of the active layer. Ground temperature, measured below the depth where it varies from one season to the next, is a good indicator of decadal to century changes in climate, while the active layer responds to shorter-term climate fluctuations (Romanovsky et al., 2010145). Ground temperature is measured in boreholes, generally up to 20 m deep, across northern Canada. Some of these monitoring sites have been operating for more than two decades, while many others were installed during the International Polar Year (IPY, 2007–2009) to establish baseline measurements of the temperature of permafrost (Smith et al., 2010163; Derksen et al., 201238). A comparison of data collected for about five years after the establishment of the IPY baseline indicates that permafrost has warmed at many sites from the boreal forest to the tundra (Smith et al., 2015a160), with greater changes in the colder permafrost of the eastern and high Arctic, where temperatures increased by more than 0.5°C at some sites over this short time period. Continued data collection has extended the time series beyond 30 years for some sites, allowing researchers to place the changes since IPY in the context of a longer record. The temperature of warm permafrost (above −2°C) in the central and southern Mackenzie Valley (i.e., Norman Wells, Wrigley) has increased since the mid-1980s, but the rate of temperature increase has generally been lower since 2000 — less than about 0.2°C per decade (see Figure 5.17 and Table 5.1). The low rate of increase is observed because permafrost temperatures are already close to 0°C in this region, so energy is directed toward the latent heat required to melt ground ice rather than raising the temperature further. In the Yukon, comparison of recent ground temperature measurements with those made in the late 1970s and early 1980s suggests similar warming of approximately 0.2°C per decade (Duguay, 201343; Smith et al., 2015b161). In contrast, in the northern Mackenzie Valley (sites designated Norris Ck and KC-07 in Figure 5.17 and Table 5.1), recent increases in permafrost temperature have been up to 0.9°C per decade, likely associated with the greater increases in surface air temperature in this region over the last decade when compared with the southern Mackenzie Valley (Wrigley, Norman Wells in Figure 5.17; Smith et al., 2017159). Observed trends in permafrost temperatures for locations in the (a) northwestern Arctic, Mackenzie Valley region and (b) eastern and high Arctic. Note that the range of the y-axis differs between graphs. Based on updates from Romanovsky et al., 2017b; Ednie and Smith, 2015; Smith et al., 2017. Since 2000, high Arctic permafrost temperatures have increased at higher rates than those observed in the sub-Arctic, ranging between 0.7°C and 0.9°C at 24 m depth and more than 1.0°C per decade at 15 m depth (see Table 5.1), consistent with greater increases in air temperature since 2000 (Smith et al., 2015a160). Short records from sites in the Baffin region indicate warming at 10–15 m depth since 2000 (see Figure 5.17 and Table 5.1), but there has been a decline in permafrost temperatures since 2012 (Ednie and Smith, 201546) that likely reflects lower air temperatures in this region since 2010. In northern Quebec, where measurements at some sites began in the early 1990s, permafrost continues to warm at rates between 0.5°C to 1.0°C per decade (Smith et al., 2010163; Allard et al., 20164). Permafrost can exist at high elevations in more southerly locations. Canada’s most southerly occurrence of permafrost, at Mont Jacques-Cartier on the Gaspé Peninsula, shows an overall warming trend at 14 m depth of 0.2°C per decade since 1977 (Gray et al., 201758). A network of thaw tubes throughout the Mackenzie Valley has provided information on trends in the active layer thickness (ALT) between 1991 and 2016 (see Figure 5.18; Smith et al., 2009164). ALT exhibits greater variability among years than does deeper ground temperature, with higher values of ALT in extremely warm years such as 1998 (Duchesne et al., 201542). ALT generally increased between 1991 and 1998 but decreased over the following decade in response to lower annual air temperatures in the region. Since 2008, there has been a general increase in ALT in Mackenzie Valley, with peak values in 2012 (Duchesne et al., 201542; Smith et al., 2017159). At sites where the permafrost is ice-rich, increases in summer thawing have been accompanied by significant settlement (subsidence) of the ground surface (Duchesne et al., 201542). A number of recent studies provide other evidence of changing permafrost conditions. Observations of landscape change over time, often based on air photo or satellite imagery interpretation, have identified areas undergoing thermokarst processes, such as lake formation and collapse of peat plateaus and palsas (e.g., Olefeldt et al., 2016126; Kokelj and Jorgenson, 201386). Over the last 50 years in northern Quebec, there has been a loss of permafrost mounds, collapse of lithalsas, and increases in the size of thermokarst ponds (Bouchard et al., 201419; Beck et al., 201514; Jolivel and Allard, 201780), while palsa decay has been observed in the Mackenzie mountains of the Northwest Territories (Mamet et al., 2017105). A recent repeat of a 1964 survey of permafrost conditions along the Alaska Highway corridor between Whitehorse and Fort St. John indicated that permafrost continues to persist in organic-rich soils, but is no longer found at other sites (James et al., 201379). Changes in lake area in Old Crow Flats since 1951 have also been linked to thermokarst processes (Lantz and Turner, 2015100). A recent intensification of thaw slumping may also be tied to changes in climate, including increases in precipitation (Kokelj et al., 201590, 2017a88; Segal et al., 2016150; Rudy et al., 2017148). In the southern Northwest Territories, forest die-off has been attributed to permafrost thawing and ground subsidence (Sniderhan and Baltzer, 2016165). Erosion of Arctic coasts in the form of retrogressive thaw slumps can result from a combination of mechanical (wave action) and thermal (warming permafrost) processes, potentially exacerbated by sea-level rise (see Chapter 7, Section 7.5; Ford et al., 201648; Lamoureux et al., 201598; Lantuit and Pollard, 200899). Departures from the 2003–2012 mean (solid line) in measured active layer thickness (and standard deviation, shaded area) for 25 thaw tube sites in the Mackenzie Valley, Northwest Territories. Climate models project large increases in mean surface temperature (approximately 8°C) across present-day permafrost areas by the end of the 21st century under a high emission scenario (RCP8.5) (Koven et al., 201391) (see Chapter 3, Section 3.3.3). While this dramatic warming will no doubt affect permafrost temperatures and conditions (e.g., Slater and Lawrence, 2013157; Guo and Wang, 201664; Chadburn et al., 201731), it is challenging to project associated reductions in permafrost extent from climate model simulations because of inadequate representation of soil properties (including ice content) and uncertainties in understanding the response of deep permafrost (which can exceed hundreds of metres below the surface). 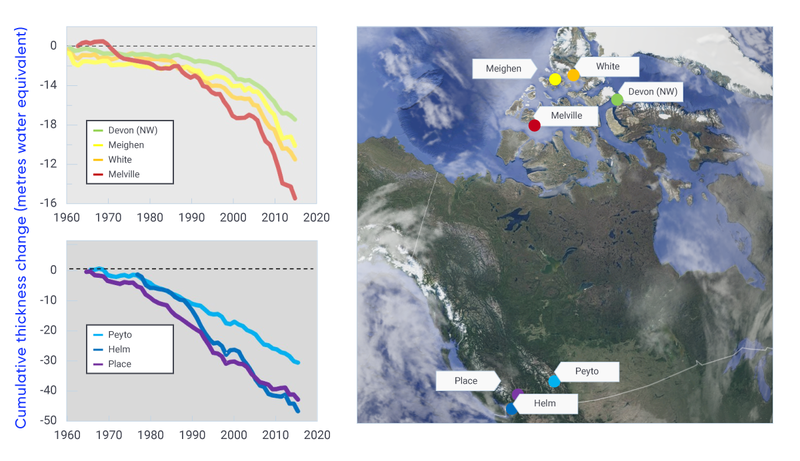 Simulations from a model considering deeper permafrost and driven by low and medium emission scenarios project that the area underlain by permafrost in Canada will decline by approximately 16%–20% by 2090, relative to a 1990 baseline (Zhang et al., 2008a199). These declines are smaller than projections from other modelling studies that only examined near-surface ground temperature (Koven et al., 201391; Slater and Lawrence, 2013157). These simulations also show that permafrost thaw would continue through the late 21st century, even if air temperatures stabilize by mid-century (Zhang et al., 2008b200). Other climate-related effects also influence the future response of permafrost to warming and complicate modelling of future conditions (e.g., Kokelj et al., 2017b89; Romanovsky et al., 2017a144). For example, intensification of rainfall appears to be strongly linked to thaw slumping (Kokelj et al., 201590). New shrub growth in the tundra can promote snow accumulation and lead to warmer winter ground conditions (Lantz et al., 2013101). Thaw and collapse of peat plateaus and palsas into adjacent ponds increase overall permafrost degradation, and gullies that form because of degrading ice wedges can result in thermal erosion and further permafrost degradation (Mamet et al., 2017105; Beck et al., 201514; Quinton and Baltzer, 2013138; Godin et al., 201657; Perreault et al., 2017131). Damage to vegetation and the organic layer due to wildfires (which are projected to occur more frequently under a warming climate) can lead to warming of the ground, increases in ALT, and degradation of permafrost (Smith et al., 2015c162; Zhang et al., 2015201; Fisher et al., 201647). Similarly, vegetation clearing and surface disturbance due to human activity and infrastructure construction can also lead to ground warming and thawing and enhance the effects of changing air temperatures on permafrost environments (Smith and Riseborough, 2010158; Wolfe et al., 2015194). In summary, a large proportion of the northern Canadian landscape has undergone, or will soon undergo, changes brought about by permafrost thaw. The temperature of permafrost is increasing across sub-Arctic and Arctic Canada, and the ALT has increased over the past decade in the Mackenzie Valley (high confidence). The rate of increase differs within and among regions due to variability in surface temperature changes, soil properties, and preceding temperature conditions. There is high confidence in these trends: they are derived from high-quality borehole measurements (permafrost temperature) and thaw tube networks (ALT), although the measurements are spatially sparse. The observed permafrost temperature and ALT changes are consistent with regional surface air temperature trends, but additional factors such as snow cover, vegetation changes, and disturbance can also modulate the response of permafrost to a changing climate. Ongoing landscape change across northern Canada associated with the expansion of thermokarst landforms was identified from surface observations and remote sensing. There is medium confidence in the assessment of thermokarst changes: they are associated with well-understood processes associated with the thaw of ice-rich permafrost, but region-specific rates of change are difficult to determine. Projected increases in mean air temperature over land underlain with permafrost under all emission scenarios will result in permafrost warming and thawing across large areas of Canada by the middle of the 21st century (high confidence), with impacts on northern infrastructure and the carbon cycle. This is the expected permafrost response to the high probability of increased surface temperature across Arctic land areas, with additional factors such as changes to snow cover, surface wetness, vegetation, and disturbance also influencing permafrost conditions. Confidence in projected permafrost changes from climate model simulations is affected by inadequate representation of soil properties (including ice content) and uncertainties in understanding the response of deep permafrost. This assessment of observed and projected changes to the Canadian cryosphere shows that the proportion of Canadian land and marine areas covered by seasonal snow, lake and river ice, and sea ice are decreasing over time; glaciers and ice caps are losing area and mass; and permafrost is warming and thawing. Further changes to the cryosphere are inevitable over the coming decades, driven by increasing air temperature. These changes will have major impacts on terrestrial, aquatic, and marine ecosystems, and on many sectors of the Canadian economy. Impacts will include risks to freshwater supply, from changes in peak pre-melt snow mass and the timing of snow melt across the country (Sturm et al., 2017172; Fyfe et al., 201750) and from loss of glaciers in the Coastal Mountains and western Rockies. More precipitation falling as rain rather than snow, combined with earlier spring thaw, will result in earlier peak streamflows, with subsequent reduced summer and autumn flows. Determining the likely timing of summer sea ice–free conditions for Canadian regions (Laliberté et al., 201697) has important implications for marine shipping in the Arctic (Pizzolato et al., 2016134). Lake and river ice conditions are important for overland transportation in the sub-Arctic and Arctic, both for goods transported via ice roads (Sturm et al., 2016171; Furgal and Prowse, 200849) and for local access to the land (Tremblay et al., 2008184). Thawing permafrost can release greenhouse gases (Olefeldt et al., 2016126) and contaminants (Schuster et al., 2018149), while permafrost degradation has effects on northern infrastructure, further adding to the high cost of northern development (AMAP, 2017b6; Pendakur, 2017129; Prowse et al., 2009136). There is a strong reliance on satellite remote sensing to provide spatially continuous and long time series of cryosphere data for climate analysis. While these data are subject to limitations, there would be essentially no monitoring capability for Canadian snow and ice (especially in the Arctic) without satellite data. Models are another important source of information, albeit limited by uncertainties in both model performance and the data used to drive the models. Glacier mass balance and permafrost changes are determined from observed measurements from a limited number of locations. While the individual measurements are high-quality, spatial coverage and representativeness is poor. Some variables are difficult to monitor at all. For example, alpine snow poses a unique challenge because the coarse resolution of snow mass data from satellites and global models and the sparse networks of surface observations do not capture land cover variability and steep topographic gradients in areas of complex terrain. Addressing these methodological challenges and information gaps, potentially through the use of regional climate model simulations (Wrzesien et al., 2018196) is important because alpine regions are extremely sensitive to climate change and have a large impact on water resources (Fyfe et al., 201750; Berg and Hall, 201717; Sospedra-Alfonso et al., 2015167). A second example is sea ice thickness in the Canadian Arctic, where surface observations are few and current satellite data are unable to provide estimates within the narrow channels and waterways of the CAA. Snow depth on sea ice influences how thick ice can grow, but measurements are currently limited to airborne surveys, with limited sampling over time periods and geographic areas. Detection and attribution studies show that climate change induced by human activity has driven observed changes to the cryosphere. This includes the decline in Northern Hemisphere spring snow cover (Najafi et al., 2016120), summer Arctic sea ice loss (Min et al., 2008111; Kirchmeier-Young et al., 201782), and declines in land ice mass balance (Marzeion et al., 2014107). Projected changes to the cryosphere are closely tied to the amount of future warming (Thackeray et al., 2016179; Mudryk et al., 2017115; Notz and Stroeve, 2016125). While continued temperature increases are very likely, there will be natural variability at the decadal scale. This suggests that the influence of natural climate variability on air temperature trends will modulate the response of components of the cryosphere across different regions of Canada over the coming decades. Regardless of this decadal-scale natural variability, the two key messages from this integrated assessment of historical observations and future climate model projections of the Canadian cryosphere are clear. The proportion of Canadian land and marine areas covered by snow and ice have decreased, and permafrost temperatures are rising. These observed changes to the cryosphere are virtually certain to continue over the coming century in response to long-term increases in surface air temperatures under all emission scenarios.